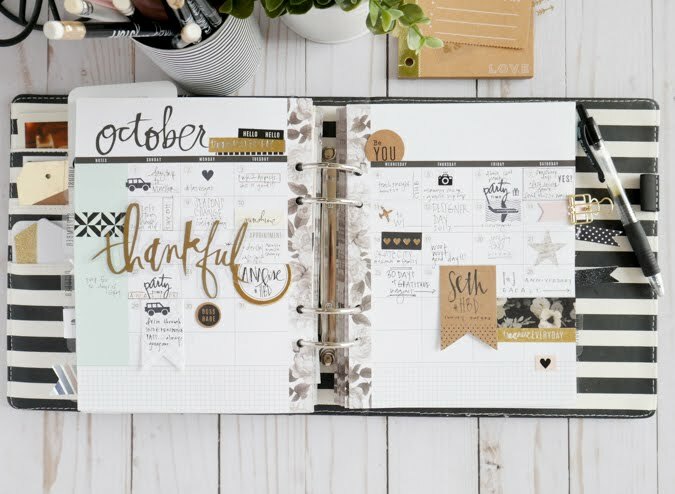 Wrappin' up October 2017 in my Memory Planner. 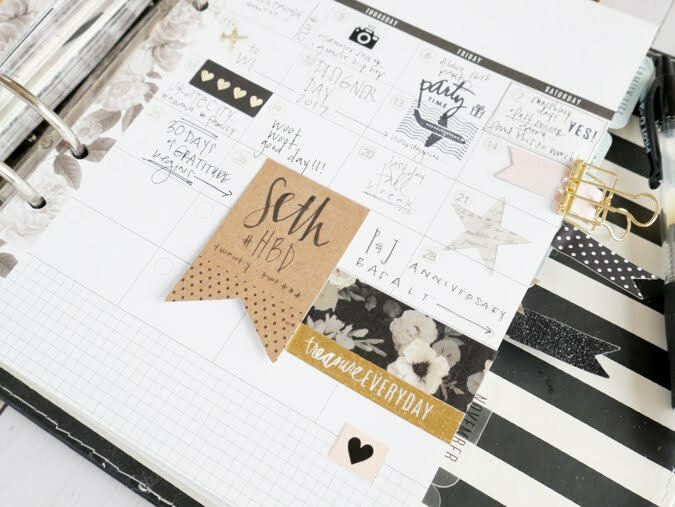 Not a month goes by that by the end of the month, at the end of a month filled in with the events, details, and inspirations of that month, that I am not just tickled happy that the Memory Planner is in my life. The pursuit of memory keeping has ebbed and flowed. A lot. 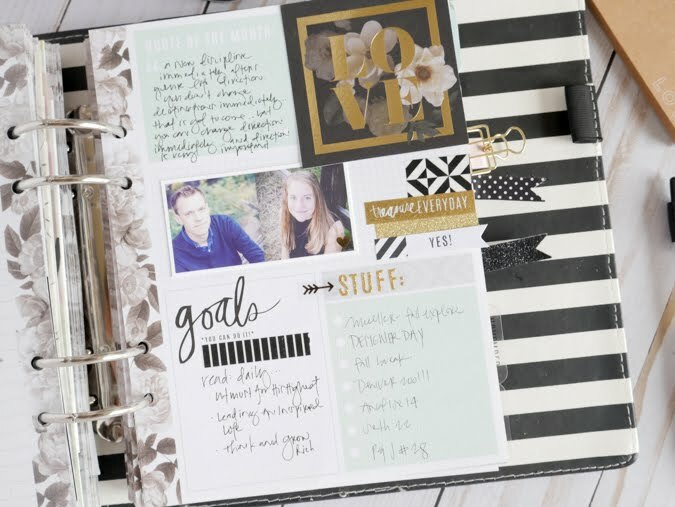 While traditional scrapbooking and storytelling are still of great importance to me, the keeping of this type planner is a personal tome of my outlook on life in real time. 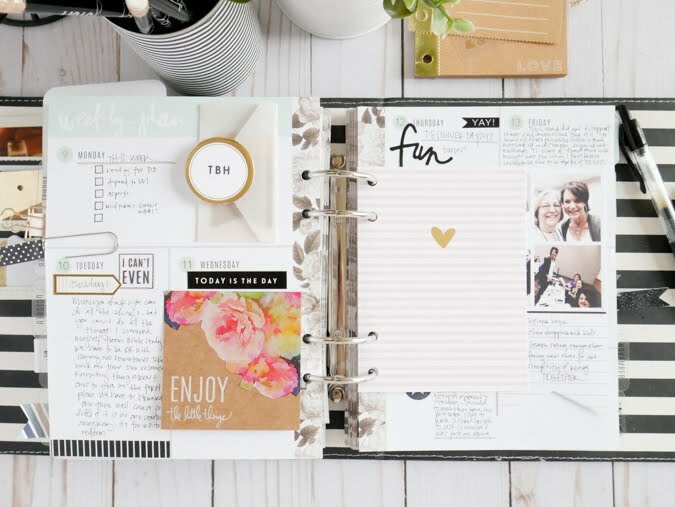 Not only is this a space that is keeper of the memories as they happen, but it's a creative outlet as well. That creativity is still high on the happy scale for me. It's part of what draws me into these pages and words and photos. 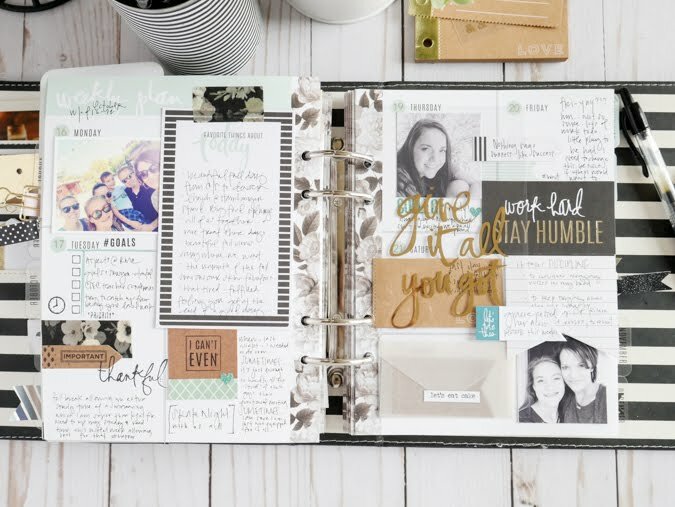 Recently I was very inspired by my fellow Heidi Swapp Media Team mate, Kim Jefferess. 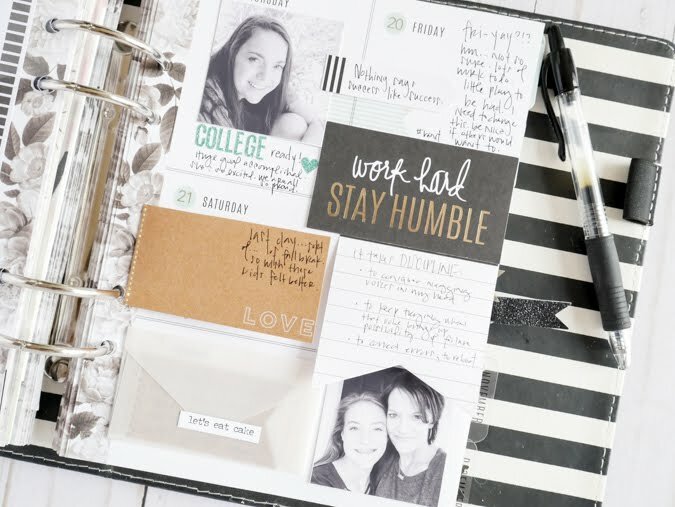 She posted this look at her Memory Planner found here at HeidiSwapp.com. Her interactive elements really drew me in to her work and her memories. 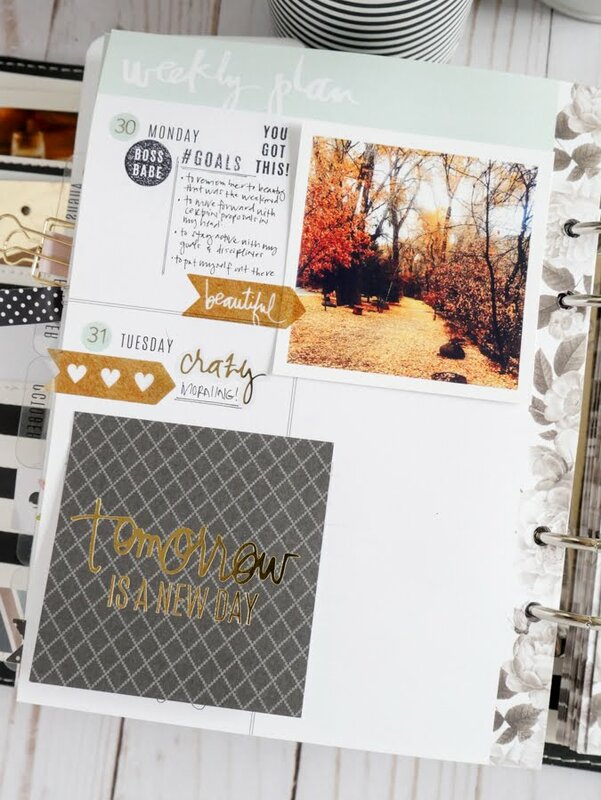 I took a page from that inspiration and it found it's way throughout this month's Memory Planner. 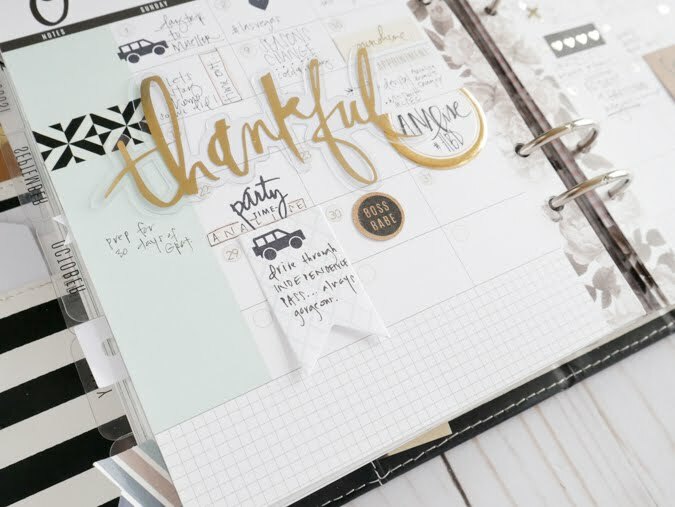 The month was full of end of the fall activity, birthdays, celebrations. 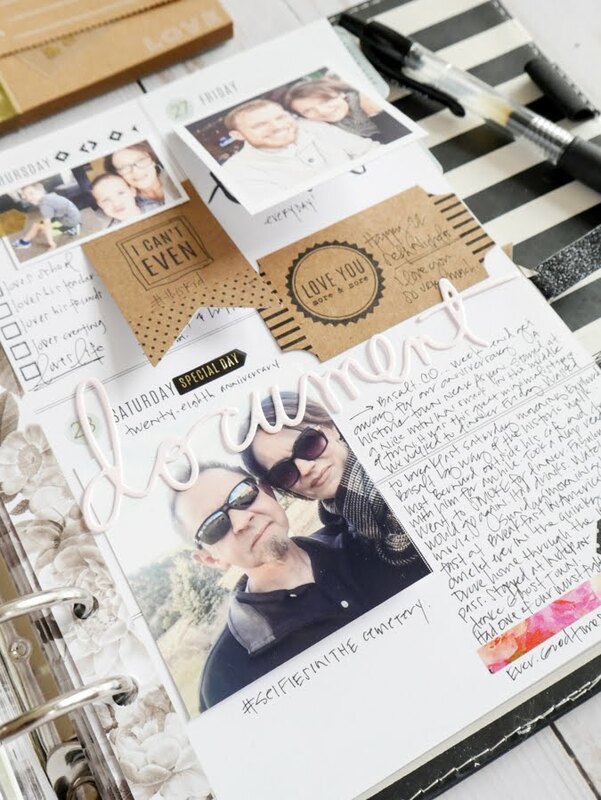 I wanted to include the feel of the events and the people that I met this month. The desire to include all the things is great with this one. 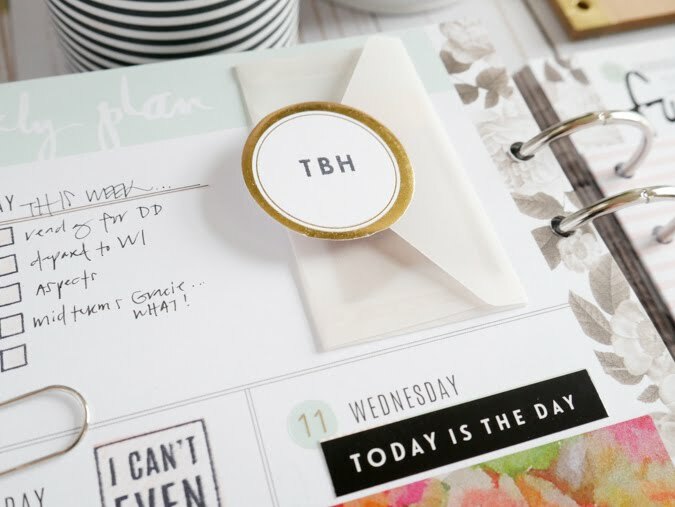 Even though the planner is a relatively small space, I think it does indeed serve to give way to the things that need to be said and remembered. 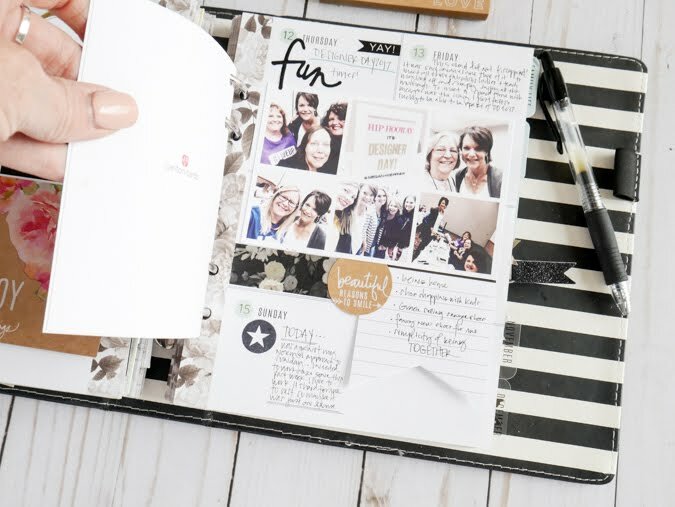 With the help of vellum envelopes holding small sentiments, I am able to add hidden journaling about the little rants here and there. 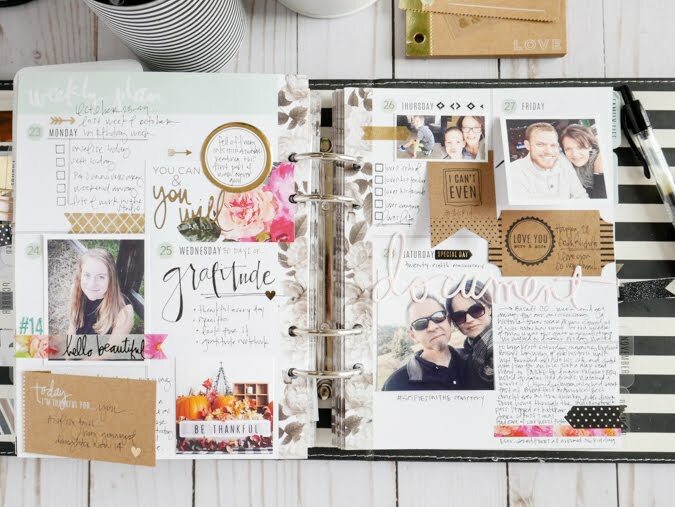 Cards of thanks and appreciation are easily added to this book just by punching holes along the edge and adding to the binder rings. 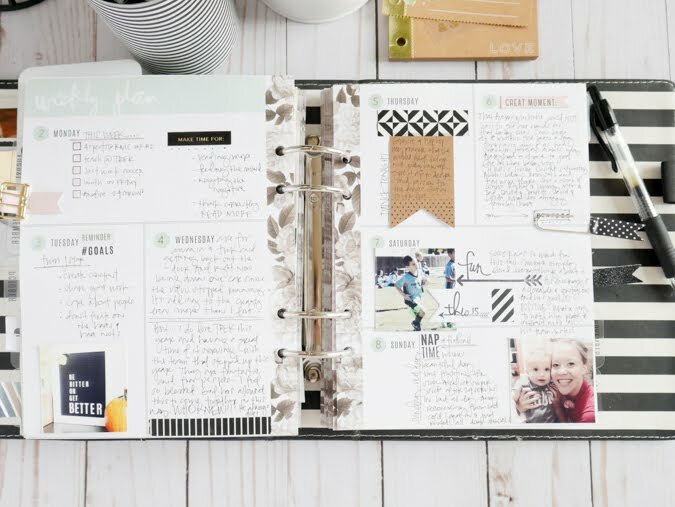 While a peek inside might overwhelm an outsider, to me, this page is full of story and memory and points in my life that I just don't want to forget. And I will. If not written down in this type format. 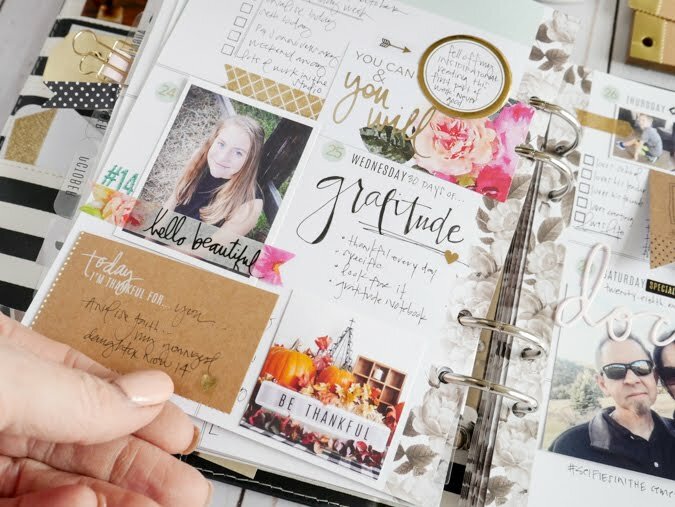 For me this book is the ultimate gratitude journal. Even though I am not afraid to add in the bad and the ugly, it's home to a whole lot of wonderful. Something amazing happens when I take the time to sit down and either create an entry for a day, or catch up on a couple days...the stories simply come to the surface. The words I thought maybe not there, are actually there. The words are there ready and willing to find way to the blank page. What a wonderful month this has been. 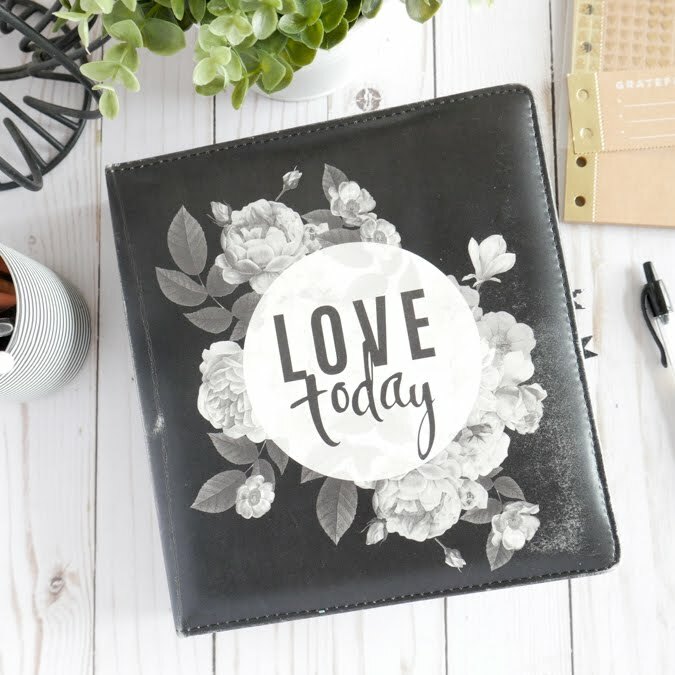 What a great way to keep it all in one space. So much to record and remember and have for future review. It inspires me all over again to tell it in the next month too.